Explore Victoria Falls from the exquisite Ilala Lodge. The epitome of refined elegance, with stunning interiors and picturesque surrounds, this boutique hotel makes for an idyllic base from which to witness one of the Seven Natural Wonders of the world. Create your own magical memories in this heavenly Eden where wildlife roam freely in the manicured grounds. Ilala Lodge Hotel is ideally located only 8 minutes away from the spectacular Victoria Falls. A family run hotel, Ilala Lodge has 73 stylish, well-appointed spacious rooms, that offer the ultimate in comfort and luxury. As we are the closest hotel to the beautiful Victoria Falls, the spray makes for a perfect backdrop during your stay. Experience a culinary journey at the award-winning Palm Restaurant at Ilala Lodge Hotel. Centrally located only minutes away from the Victoria Falls, The Palm Restaurant offers a magnificent à la carte menu for breakfast, lunch and dinner. Guests can choose from an extensive list of South Africa’s finest wines, cocktails and artisan gins. We offer an unrivalled al-fresco dining experience under the starlit African sky, with the sound of the Falls in the background. The Palm Restaurant is an adventure for the appetite that is not to be missed. Relive the historical journey embarked by David Livingstone exploring the mighty Zambezi River aboard the Ra-Ikane fleet. Named after his instrumental guide, the boats represent the grace of a bygone era honouring the rich history of Victoria Falls and its explorers, adventurers and heroes. The Ra-Ikane offers a variety of cruises, including breakfast, lunch and sunset, as well as private charters. Ilala Lodge Hotel is ideally located only 8 minutes away from the spectacular Victoria Falls. A family run hotel, Ilala Lodge has 73 stylish, well-appointed spacious rooms, that offer the ultimate in comfort and luxury. As the closest hotel to the beautiful Victoria Falls, the spray makes for a perfect backdrop during your stay. The award-winning Palm Restaurant is famous for its gourmet cuisine and is highly rated on TripAdvisor. Diners can see the spray and hear the thunder from the Victoria Falls, while they enjoy al-fresco dining at The Palm Restaurant. The Palm Restaurant at Ilala Lodge Hotel is one of the finest restaurants in Victoria Falls and offers guests a delicious á la carte menu for breakfast, lunch and dinner. The accommodating and friendly staff at this top-rated restaurant will ensure your dining experience is perfect. Guests at The Palm Restaurant can choose from an extensive and top-quality list of South Africa’s finest wines and artisan gins; they can also enjoy a tasty cocktail by the pool at our Poolside Bar. The ideal location of The Palm Restaurant has made it a favourite among all visitors to Victoria Falls. Guests can enjoy gourmet al-fresco dining under the starry African skies while listening to the roar of the Falls. The ambience of the restaurant and the superb cuisine make for a memorable meal. Some of our most popular dishes include the Crocodile Frikadelle, the Blesbok Shank and for dessert, the scrumptious Chocolate Delice. With its world-class service and fare, the Palm Restaurant is a great place to celebrate a special occasion or just to relax and enjoy your stay. Join us for a delicious brunch held on the last Sunday of each month. We look forward to welcoming you to this elegant Victoria Falls restaurant. Relive the historical journey embarked by David Livingstone exploring the mighty Zambezi River aboard the Ra-Ikane fleet. Named after his instrumental guide, the boats represent the grace of a bygone era honouring the rich history of Victoria Falls and its explorers, adventurers and heroes. The Ra-Ikane offers a variety of cruises, including breakfast, lunch, sunset, as well as private charters. Conveniently located a mere 10 minutes’ walk away from the majestic Victoria Falls, Ilala Lodge is an ideal base from which to explore the falls and the myriad of activities the town has to offer. This holiday resort in Zimbabwe offers affordable rooms in elegant and private surrounds without compromising on the quality. The Victoria Falls National Park borders the front of the lodge affording game to come and graze on the hotel lawns with the spray of the falls in the background, a sight to behold for the guests of Ilala. Victoria Falls accommodation is offered in thirty-two spacious rooms on two floors that were strategically designed to allow for maximum panoramas of the spray of the falls. Although the sprays can be clearly seen from the upper balconies, the ground floor has its fair share of allure as it enjoys close proximity to the wildlife that roams the gardens. The rooms are furnished in comfy and fairly timeless style. All rooms feature en-suite bathrooms with separate showers, overhead fans, air-conditioning, satellite TV, early morning tea/coffee as well as a fruit safe. The rooms on the upper floor open out onto a balcony whilst the lower rooms have double patio doors that lead out onto Ilala Lodge’s manicured grounds. White water rafting in Victoria Falls is amongst the thrilling adventure activities on offer at this stunning Zimbabwe accommodation. Not for the fainthearted, partake in an exhilarating bungee jump or the ‘Flight of Angels’ aboard a light aircraft and soak in the scenic views on top of the falls. Other Victoria Falls safaris include elephant rides and lion walks, sunset and river cruises, game viewing as well as sightseeing and cultural activities. Adventure, Birding, Fishing, Flora, Gourmet, Leisure, Nature, Relaxation, Wildlife, Wine, And more. 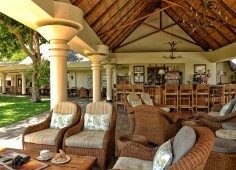 Ilala lodge is situated a mere 20 minutes’ walk from the majestic Victoria Falls. Imagine taking 23 days to explore some of the wildest and most beautiful destinations in Botswana, Zimbabwe and Namibia? Not for the faint-hearted, this safari is go, go, go but it is all about the sights, scenery and fun. Plan your budget in advance for a deeper experience: 8 nights in Botswana at several luxury bush camps, transferring by private charter plane. Then 2 nights in Zimbabwe’s Vic Falls followed by 12 days driving through the vast Namibian landscape. Visit an awesome UNESCO World Heritage Site and natural border between Zimbabwe and Zambia. The Victoria Falls is worth seen from a helicopter or a bungee jump. See huge herds of elephants while enjoying the tranquillity of the renowned Chobe Riverfront. Spot lions lurking in the shade of huge indigenous trees while hippos grunt and Fish Eagles cry. Then, when you get to the Okavango Delta wilderness, you will see real wildlife in action. Experience this huge floodplain brimming with plant and animal life in a desert setting. Take 5 days to see something of the wildness and excitement of Africa with this incredible Victoria Falls – Chobe combo safari holiday. Get away to luxurious 4-star hotels and allow experts to show you the World Heritage Site from the air and to hear stories about the history of Victoria Falls during a sunset cruise. See elephants and lions from the Chobe River then watch the sun set as Fish Eagles dive for fish beside your boat. Welcome to a family-run guest lodge brimming with warm hospitality and geniality. Find Bayete Guest Lodge in the residential suburbs of Victoria Falls and choose a suite nestling in blooming gardens. Deep in the Moremi Game Reserve lies Khwai Guest House, run by the Khwai community – a cosy nest from which you can explore the wilderness on game drives and in mokoros. Heading deeper into the Okavango Delta, choose Oddball’s Camp which is one of the oldest and best known bush camps here.